Our story opens with our heroes prowling the street in fedora’s and trenchcoats searching for an all-night pizzeria when they come across a sumo wrestler, named Tattoo, breaking into a pet shop and mumbling something about “wanting to go home.” But when the TMNT try to subdue the gigantic wrestler, he electrocutes himself and transforms into a hamster and quickly walks into a cage with other hamsters. 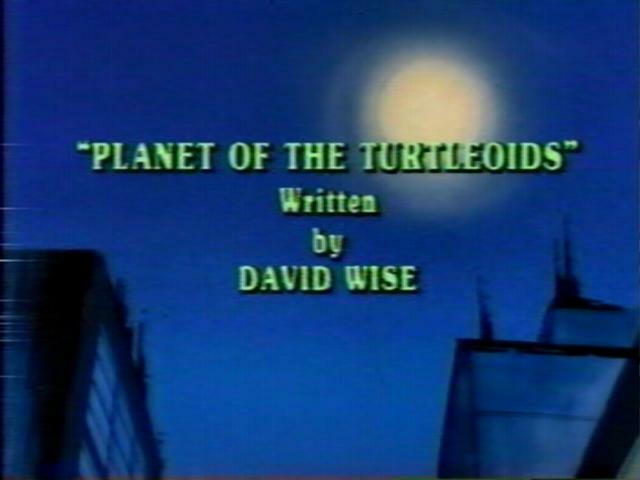 The Turtles deduct that this must be the work of Shredder and Krang… that the deadly duo are once again fooling around with the Mutagen. Meanwhile, Shredder and Krang are indeed fooling around with the Mutagen, as they prepare to create more Mutants so that they can break into the Museum and steal a giant ruby. The villains hope that they can use the gem to refocus Krang’e new heat ray and finally free the Technodrome. Back at the lair, Donatello reflects on the incident at the pet shop and wonders if maybe they would all be better off if they were still just regular turtles, or better yet, if they could live in a world of turtles. Later, that same night, at the City Wild Animal Park, Shredder and company abduct one lion and one gorilla to prepare for mutation. Meanwhile, while drowning his sorrows in a root beer float and lamenting his status at Channel Six News, vis a vis April O’Neil’s, Vernon encounters a reptilian alien named Kerma, wearing a trenchcoat and fedora, and runs screaming into the night. Nonplused, Kerma arrives at the City Wild Animal Park and sets free Shredder’s lion and gorilla before they have been mutated and, thanks to Bebop and Rocksteady’s bumbling, a bull and a mole are mutated instead — becoming GROUNDCHUCK and DIRTBAG. Shredder decides that these two new mutants will have to do and orders them to steal the giant ruby from the museum. Back at Channel Six, Vernon tells April about his encounter with what he believes to be one of the Turtles — only the Turtle he met was three feet tall. April is sure that Vernon did not meet one of the Turtles and contacts them, asking them to meet her at the news station where they explain that whoever Vernon did see it was not one of them. 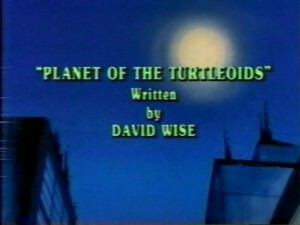 But the Turtles are concerned that someone is “copying their style” and set out to investigate. As soon as the Turtles leave the Channel Six News Building, not only do they encounter Groundchuck and Dirtbag, who are itching for a fight, but Kerma as well, who captures all six of them and takes them back to his space ship — which is designed to look not unlike the Chrysler Building. April arrives down on the street with her mini-cam, but the Chrysler Building/Rocket Ship blasts into space.